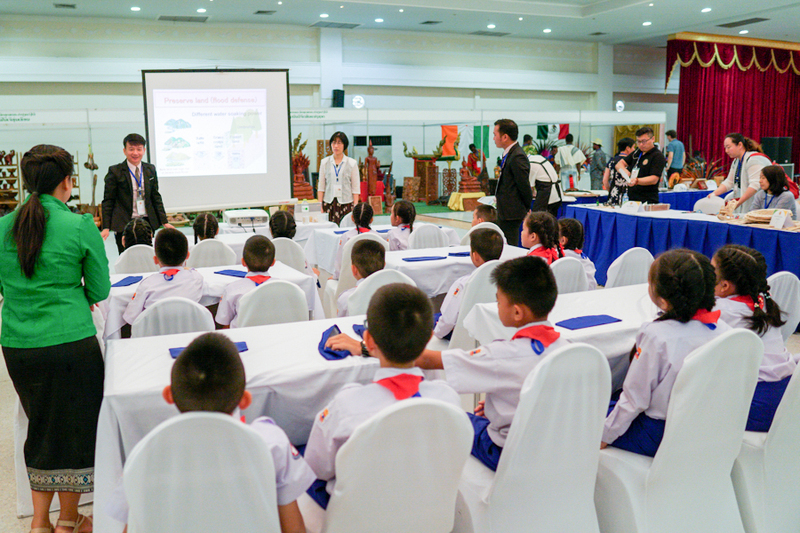 The 2018 World Wood Day Celebration in Lao PDR opened on March 29 at the International Trade Exhibition and Convention Center (ITECC) in Vientiane Capital City. Mr. Phankham Viphavanh, Vice President of Lao PDR, and Mr. Sengnouane Xayalath, Vice Chairman of the Lao National Assembly, attended the opening ceremony accompanied by ministers and head of all co-organizers, deputy ministers of equivalent organizations, and diplomats from international organization to Lao PDR. Nearly 100 international artists from 20 countries and regions, local artists, musicians, folk artisans and entrepreneurs, and more than 300 people attended the opening event. Mr. Liane Thykeo, Minister of Agriculture and Forestry of Lao PDR, gave a welcome speech. Dr. Chung-Yun Hse, President of the International Wood Culture Society, delivered welcome and introductory remarks. The Vice President of Lao PDR, Mr. Phankham Viphavanh, was invited to ring a traditional bell “Khong” to officially open the ceremony. Local and international music groups provided the audience a visual feast of wooden music performances. Five international artists (Bahrain, China, Norway and Zimbabwe) and two local woodcarvers were invited to the program. Many thanks to the Lao Furniture Industry Group Company in assisting the carvers on the first day. Carving slabs were selected at the factory and the carvers discussed and merged their ideas for the event theme “Life.” The results from the first day laid a very good foundation. The group continued carving at the ITECC main venue for the three event days. The audience was able to witness how the unique relief woodcarving was created from two pieces of raw wood slabs and appreciate the carvers’ craftsmanship. 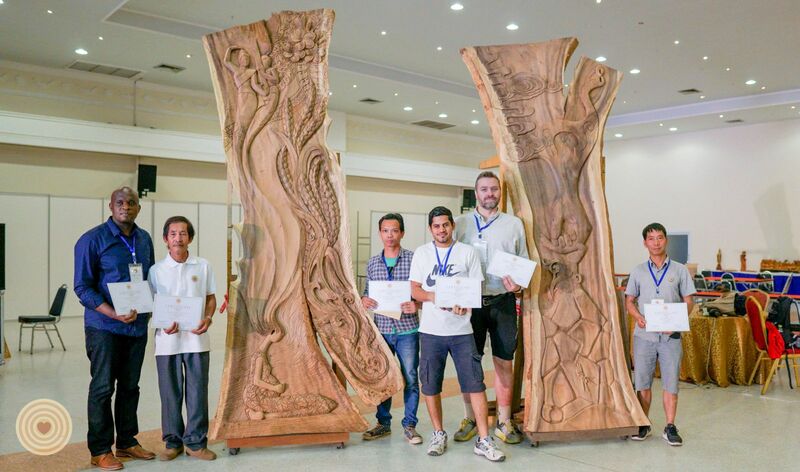 23 talented woodcarvers from Laos were selected to participate in the woodcarving competition. They worked on their woodcarving works for three intense days that reflected the event theme of "Life" in Lao and the Lao people. A professional panel of judges reviewed all the carvings and winners were awarded at the closing ceremony. Local carvers also brought some of their high quality works to exhibit at the venue that showed their skills and creativity. This program invited three talented international and three local young furniture makers. 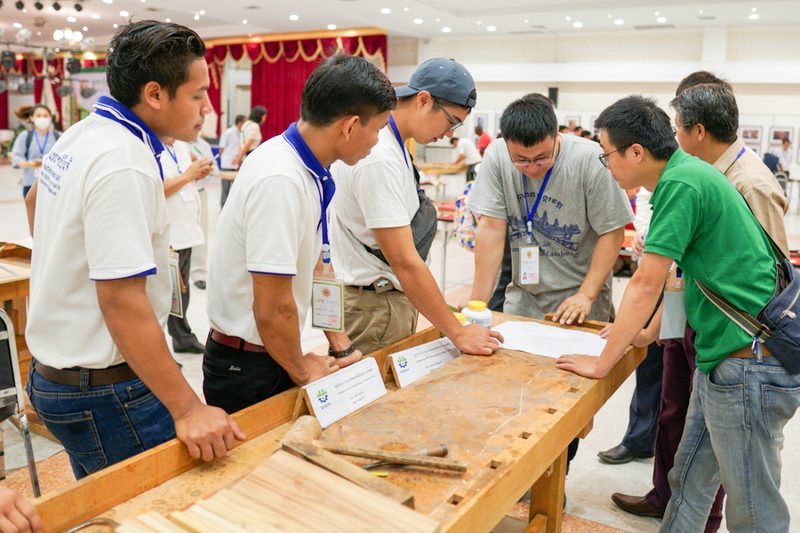 The international team members included two WorldSkills winners and champion of the Chinese National College Student Woodworking Competition. The three locals were from the Vetsaphong Skill Development and Testing Center of Ministry of Labor and Social Welfare of Lao PDR. Techniques were exchanged in mutual appreciation and strong bonds were formed among the invitees. 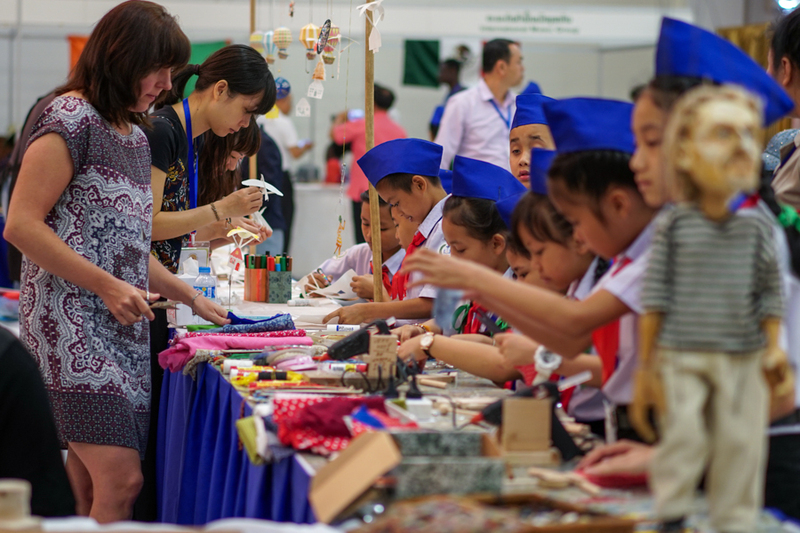 A fun-filled Folk Art program not only brought amusement and excitement, but also a special opportunity to learn and respect various wood cultures from different parts of the world. It facilitated understanding and connected different regions, individuals and beliefs beyond language barriers. The program encouraged people to appreciate the beauty of wood and paper, which are often overlooked. There were more than 6 different music and dance ensembles from Laos and five international music and dance ensembles. 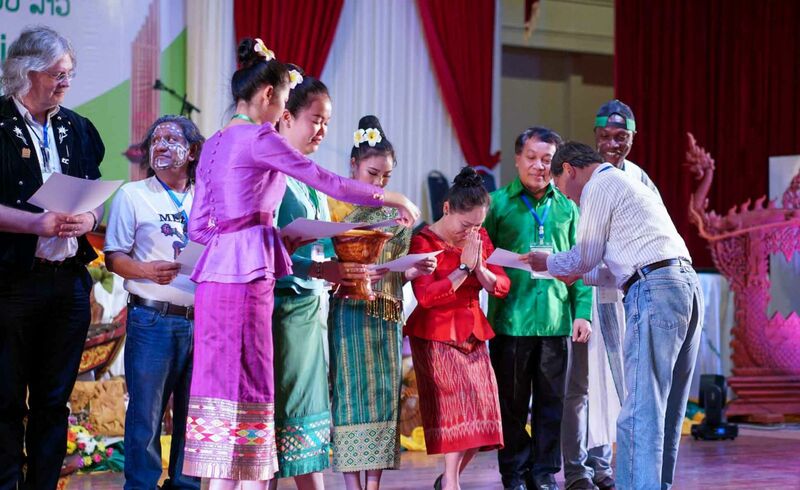 Laos organizers had meticulously thought of ways to present their culture, music and dance to the world. 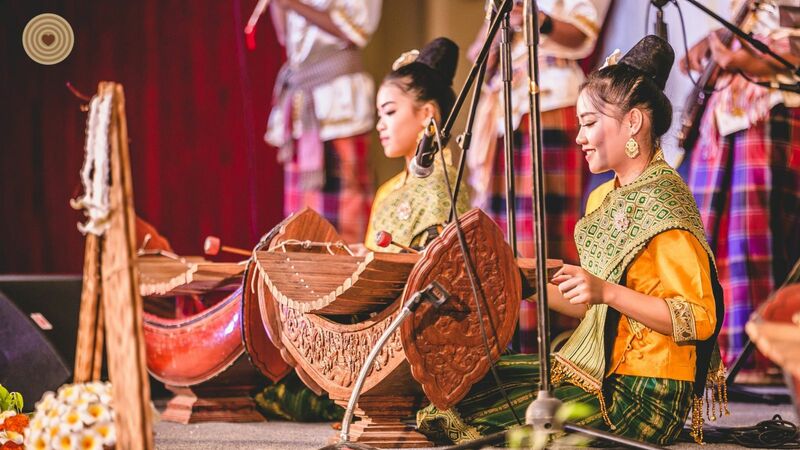 The main stage was carefully designed with Laos traditional wooden arts and musical instruments. Laos cultural performances range from traditional Laos orchestra to eye-catching folk dances. International ensembles also received much attention through their unique outfits and musicality. Wood will play a prominent role in our future and it is our duty to teach the younger generation how to responsibly use wood. Dr. Yang Ping instructed interactive classes with a series of experiments to show the advantages of wood to the children. They learned about wood through their senses of smell, touch and hearing. After class, an "I Love Tree' drawing activity and wooden toys from China provided much fun and entertainment. These hands-on experiments inspired creativity and a love for wood, a sense of respect and responsibility towards wood, forest and nature. 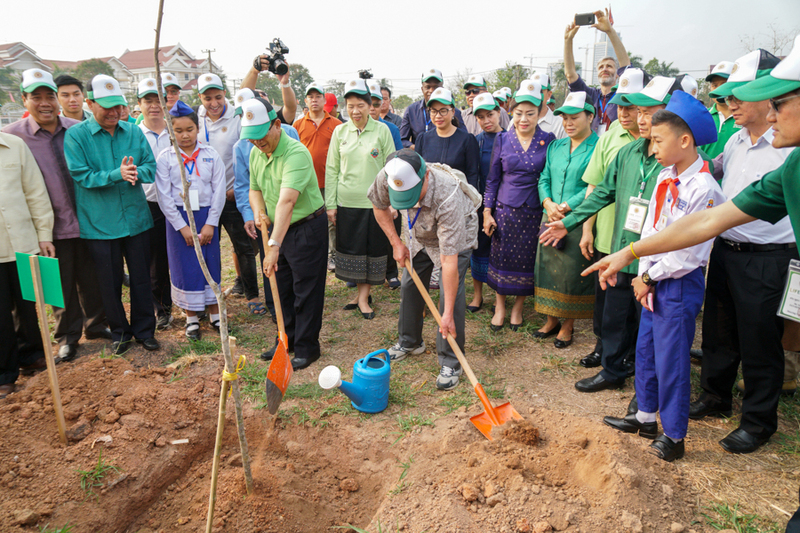 The tree planting activity was held at the newly-built Lao National Museum in Vientiane on March 30, 2018 and was attended by Dr. Liane Thykeo, Minister of Agriculture and Forestry, Dr. Chung-Yung Hse, President of IWCS, and hundreds of international and domestic guests. Lao PDR, as a forest-rich country, welcomes all efforts to increase awareness on the value and sustainability of natural resources. To mark 2018 World Wood Day celebration in Vientiane, the tree-planting sub-committee prepared one hundred trees from the most valuable species, including Mai Dou(Pterocarpus), Mai Gnang (Dipterocarpus), Mai Te-Kha (Afzelia) and Mai Kha-Gnoung (Dalbergia). 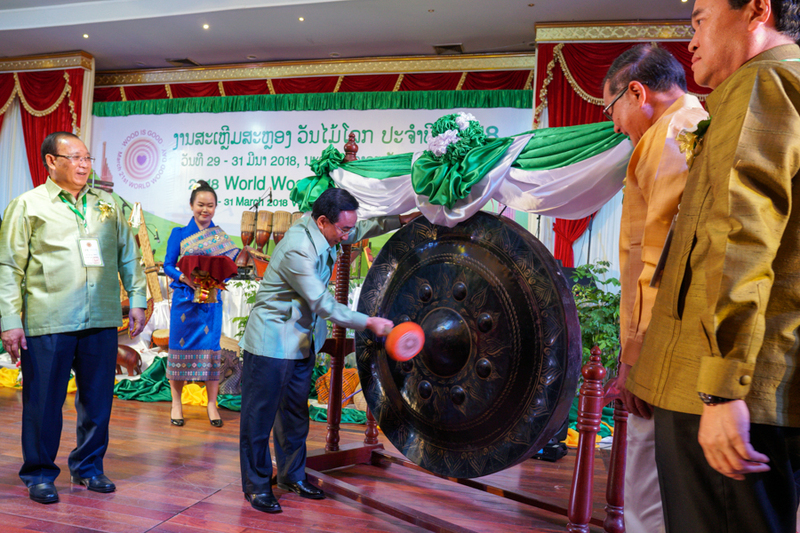 Director General of Forest Department of Minister of Agriculture and Forestry said during his remarks that tree-planting is a very good symbol of the 2018 WWD event in Lao PDR and hope they will continue to grow, provide shade, clean the air, and bring joy for many years to come. 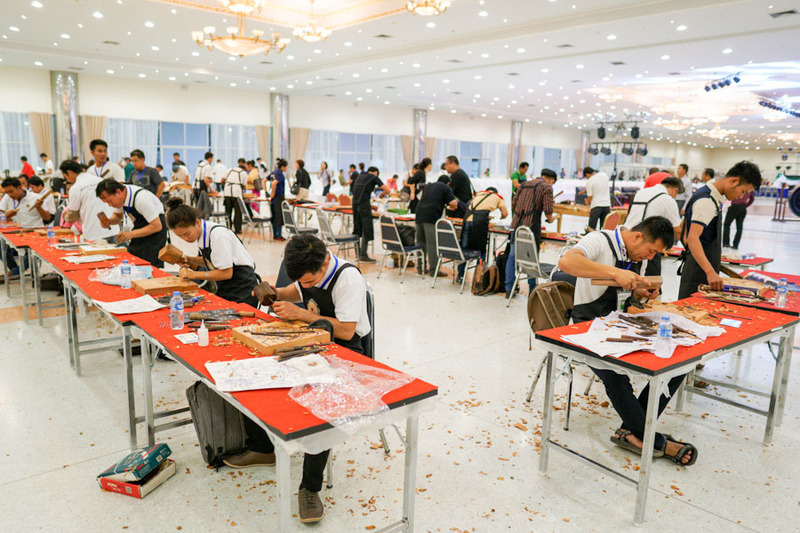 The 2018 World Wood Day celebration in Lao PDR came to an end on the afternoon of March 31, 2018 after the results of the woodcarving competition were announced. Each participant went on to stage to accept an awarding certificate. The closing ceremony and event concluded with dance and music from local and international musicians.